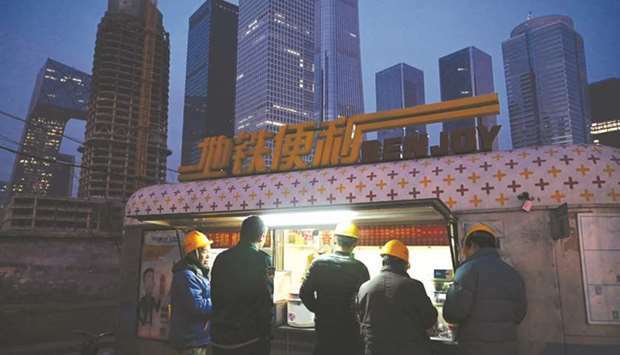 Construction workers buy snacks at a food stall in Beijing’s central business district. China’s economy grew at its slowest pace in almost three decades in 2018, analysts in an AFP poll said yesterday, as the government struggles to contain ballooning debt and a bruising trade war with the US. The full-year figure of 6.6% would be the worst since 1990, when the economy was hit by outrage over the Tiananmen Square crackdown a year earlier. The October-December rate of 6.4% marks the slowest quarter since 2009 and indicates China faces a tough year ahead. A widely respected global business think tank, the US-based Conference Board, says its methodology indicates growth of 4.1% growth for the year. Relations with top trading partner the United States deteriorated sharply last year after President Donald Trump hit roughly half of Chinese imports with new tariffs in an attempt to force trade concessions from Beijing. The trade war with the US is on hold for now after President Xi Jinping and Donald Trump agreed a three-month ceasefire while the two sides try to find a resolution. While analysts say the standoff has dented confidence – leaving the stock markets battered and the yuan weakened – they attribute most the downturn to government policies to tackle growing debt, financial risk and pollution. The 2018 growth forecast is above the official target of around 6.5% but down from the 6.8% chalked up in the year before – after officials on Friday revised down the 2017 figure. It is one of a raft of recent economic indicators that point to a deepening slowdown. Imports and exports fell in December while the manufacturing sector contracted for the first time in more than two years. “We see a fast deceleration on investment and also retail sales, which weigh on the growth slowdown,” said Liu Ligang, chief China economist at Citigroup. “The financial deleveraging made it really hard for the private sectors to get funding,” he said.